Q&A: Will BOC Raise its Interest Rates This Week? Are you ready for the only major monetary policy statement scheduled this week? Tomorrow (July 12) at 2:00 pm GMT the Bank of Canada (BOC) will publish its monetary policy decisions for the month of July. What’s the big deal about this week’s decision? 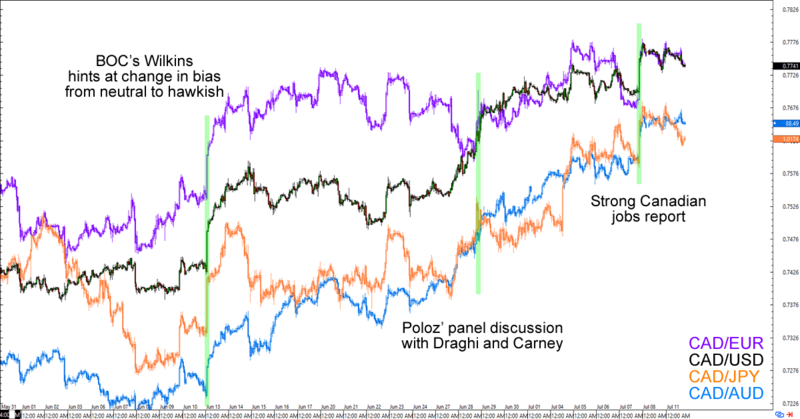 Recall that central bank head honchos Mario Draghi, Mark Carney, and Stephen Poloz made a big splash in the forex scene in late June when they hinted that their respective central banks are ready to join the Fed in the tightening bandwagon. Well, Poloz will have the first chance to walk the talk this week. Will the BOC raise its interest rates for the first time since 2010? That’s seven years ago, yo! But first, what did the BOC say last month? In the takeaways of the May policy statement, we discussed how the central bank was pretty happy about the economy. It shrugged off inflation broadly missing its estimates, saying that it’s still “broadly in line” with their April projections. It also lauded the economy by saying that “recent economic data have been encouraging, including indicators of business investment” while consumer spending and the housing market remain “robust” thanks to an “improving” labor market. How did the Loonie react? There was no forward guidance with the release, but the BOC’s optimism was all the Loonie bulls needed to push the comdoll higher. The Canadian dollar shot up by 40-60 pips against its major counterparts in the first hour of the release and stayed strong until the end of the week. What are market players expecting this time? In a word, a rate hike. Okay that’s three words but you get what I mean. It all started in mid-June when BOC Senior Deputy Governor Carolyn Wilkins said in a speech that the economy was starting to “pick up” and is showing signs of “moving past” the oil shock. But those are just pretty speeches. What do the data say? Some analysts pointed out that, aside from Fridays’ jobs report, Canada’s economic reports have still been mostly in-line or slightly below the BOC’s forecasts in the last two policy meetings. Don’t believe me? Check out Canada’s economic snapshot! Meanwhile, others think that the BOC can’t afford to sound too hawkish while the economy is still uncertain over major issues like inflation, business investment, and the North American Free Trade Agreement (NAFTA) negotiations. “…when you are driving towards a red stoplight, you ease up on the accelerator well before you get there instead of waiting for the last second to stop. I think the same thinking is true in monetary policy, because you must anticipate where the economy will be 18 or 24 months from now. “…there is a substantial lag between when the economy approaches full capacity and when that begins to translate into inflation…For Canada we have fairly soft core inflation right now, but that is mainly the product of the widening of our output gap two years ago during the oil price shock. So based on the clues above, we now know that (a) BOC officials think previous rate cuts “have done the job;” (b) they expect the economy to sustain its “above potential” growth; (c) they think the output gap will close in H1 2018, and (d) they don’t need inflation to hit their targets before tightening their purse strings. So a rate hike is expected. How might the Loonie react? Forex trading 101 would tell you that rate hikes (and it does look like Poloz and his gang have set us up for one this week) are bullish for the currency. However, you should note that the Loonie has been climbing steadily against its counterparts since Wilkins said her piece some time in mid-June. And with a lot of forex traders already on the rate hike train, the move might already be priced in. If the BOC raises its rates as expected and offers nothing new or even sneaks in a dovish remark or two, then expect to see some profit-taking across the board. If the bank raises its rates and hints at more to come (as it did back in its tightening cycle in 2004 when it raised rates nine times in four years), then we might see an extension of Loonie’s rallies. But if BOC officials decide to keep rates steady and postpone its rate hike to October as some are speculating, then we could see the Canadian dollar erase most of its gains from the last couple of days.